Floating solar lights are ideal for pool, ponds, water fountains, or other water features. Another great option is to place these lights in a flowerbed, around a deck or patio, or along a walkway or pathway. Electricity and water is a very dangerous combination. Solar Energy and sealed circuitry, however, allows for safe, beautiful solar floating lights that can be safely used in any area of your landscapes or waterscapes. Want your Floating Solar Light to stay where you put it? If you choose to let your light float, but you would like the light to remain in a certain place on the top of the water, all you need to do is attach a tether to the floating solar lights and then attach the other end to a weight (a simple rock works just fine) at the bottom of the water. During daylight hours, a carefully concealed solar panel acts to charge the rechargeable battery. With six hours of charging time, these lights can operate for a full eight hours after dark. Light sensing technology automatically triggers illumination when the sun begins to set and automatically turn the light off again once the sun returns, so there will be no need for you to go to the trouble of trying to turn them on and off manually. These lights are both durable and weatherproof. 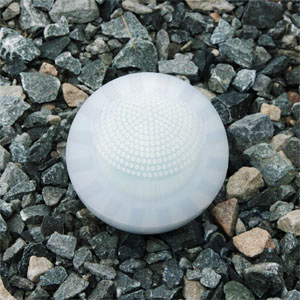 Many of these lights come along with a one year limited warranty, Globe shaped floating solar lights are available with either white or blue LEDs. The Aquabright floating solar light offers a more modern look. It shifts between red, pink, green and blue light. Installation of these floating solar lights could not be simpler. All you have to do is float or place the light anywhere it will receive sunlight. Light sensing technology will automatically turn these lights on when it gets dark and off again when the sun rises. During the day, a concealed solar panel harnesses the energy of the sun to charge the rechargeable battery, and after six hours of charging time, these lights are ready to operate for a full eight hours after sunset. Light sensing recognizes when it gets dark and automatically triggers the light to illuminate. When the sun comes out again, these floating solar lights automatically turn themselves off. Solar powered floating lights are both durable and weatherproof and many models come along with a 1 year limited warranty. Some of the floating solar lights we offer include Globe shaped solar lights which are available with either white or blue LEDs and the Aquabright floating solar light which offers more a modern look and shifts between red, pink, green and blue light. Interested in learning more? Check out our Floating Solar Lights here.